, originally uploaded by plingthepenguin. 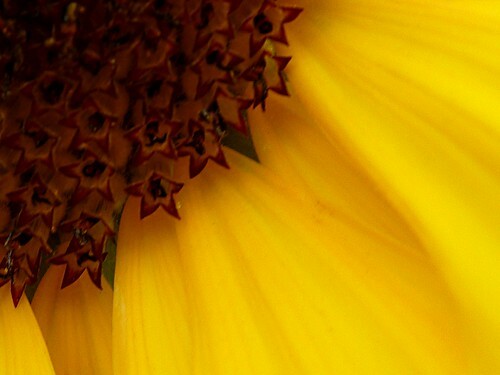 This sunflower one is my favourite although I think the focus is very slightly off. Other contenders (for me) were this one (which had the most post-processing), this one (which was one of J's favourites), this one (although the seed is possibly a little indistinct against the background) and this one. Current Music: Arctic Monkeys "Whatever People Say I Am, That's What I'm Not"
First of all, the music choice is very good. Also, your photos are nice. You seem to have an eye for composition which is probably the most difficult bit to learn to do well. I left my comments on flickr but overall I really like the photos. I did zip past the spider ones as even a brief glimpse makes me feel like leggy things are crawling all over me! I had meant to do this earlier, but got side-tracked. I have noticed that your eye for photos have been improving very nicely though (can't remember if I've mentioned, but I definitely know that I've seen some and remarked with 'Ooh, that looks cool' or 'Ooh, that's a really nice one'. I'll leave some comments on Flickr for this set though.